Let me explain what we have here. This is a kit bashed Librarian, and probably my best kit bash as of yet. 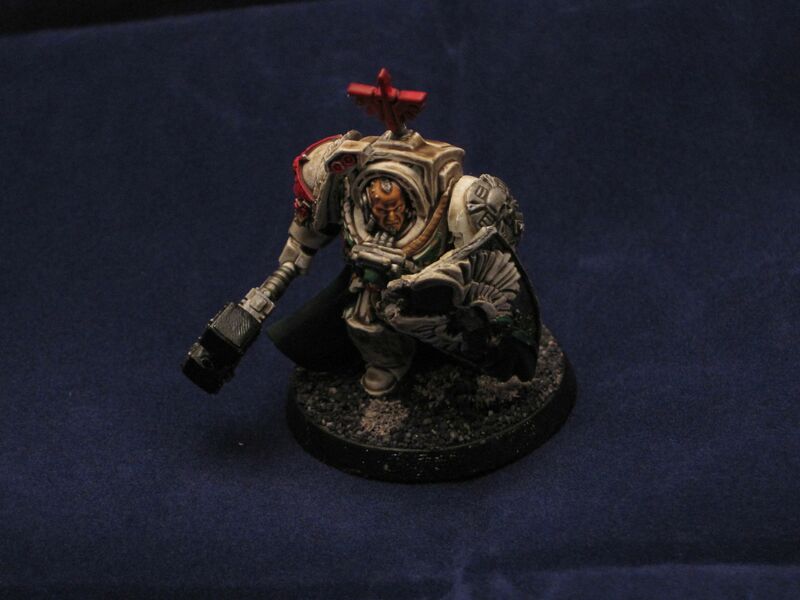 His front torso, legs, head and non Crux Terminatus shoulder pad are from the Deathwing Command Squad box. Which by the way is really awesome, so many extra bits it is insane! Oh and his staff is from the same box set as well, it's the Deathwing Knights Knight Master's flail. 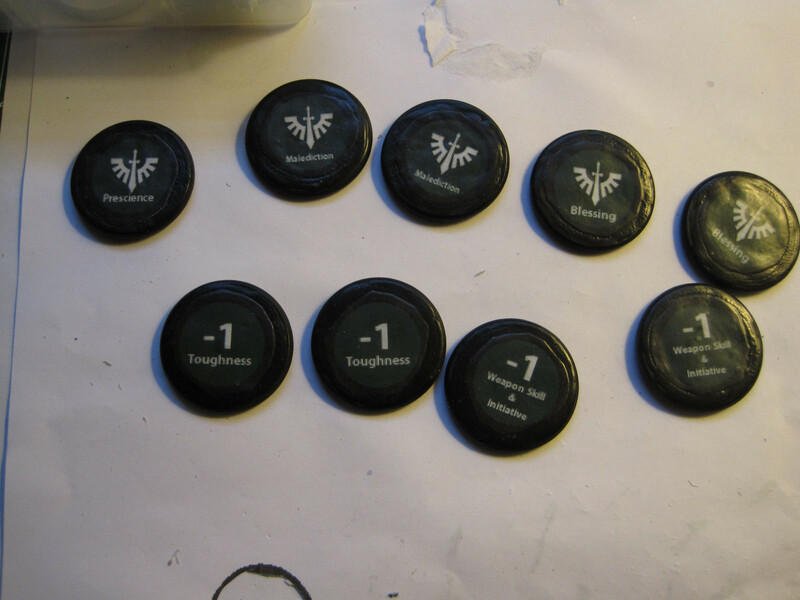 I leveled the top and found a Chapter Symbol from one of the many Dark Angels Chapter Upgrade Sprues that I bought during the 4th edition release. The Crux Terminatus is from Forge World. 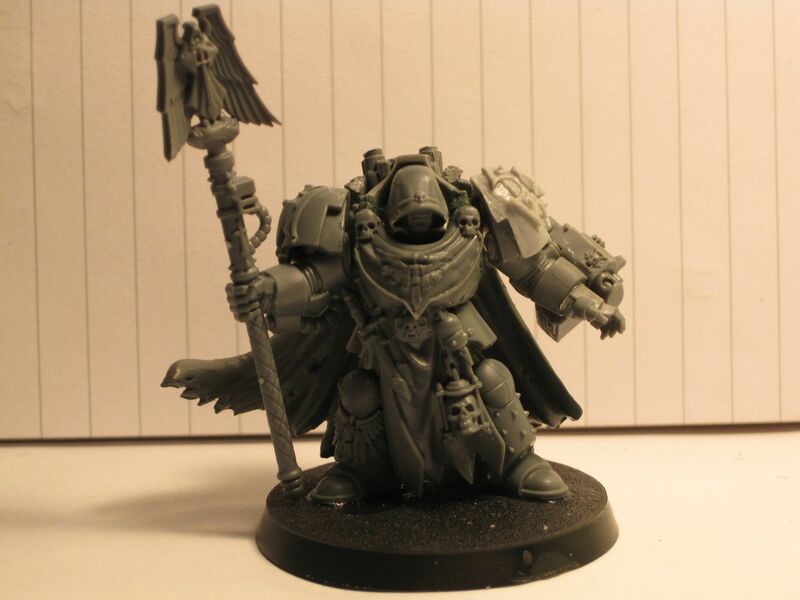 I was thinking of using the Forge World Deathwing Terminator Pads that I have, but I think the angels look cooler. 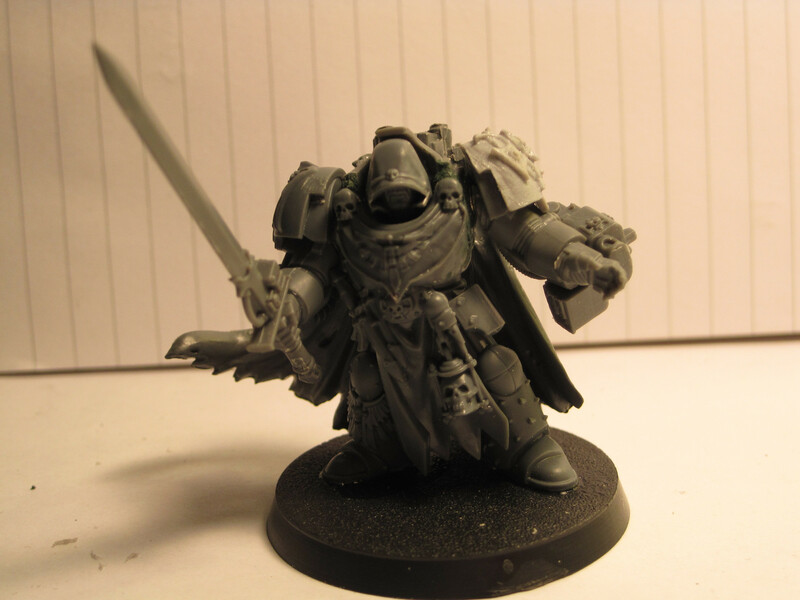 His sword arm, storm bolter arm, and you can't really see it in the above picture, but his back torso is from the Grey Knight Terminator box. The Grey Knight Terminators already have Psychic Hoods built into their back torsos. Which is why I used it, while there aren't a bunch of tubes running to his head, I think it'll be okay to say they are under the hood. Last but not least is the cloak. 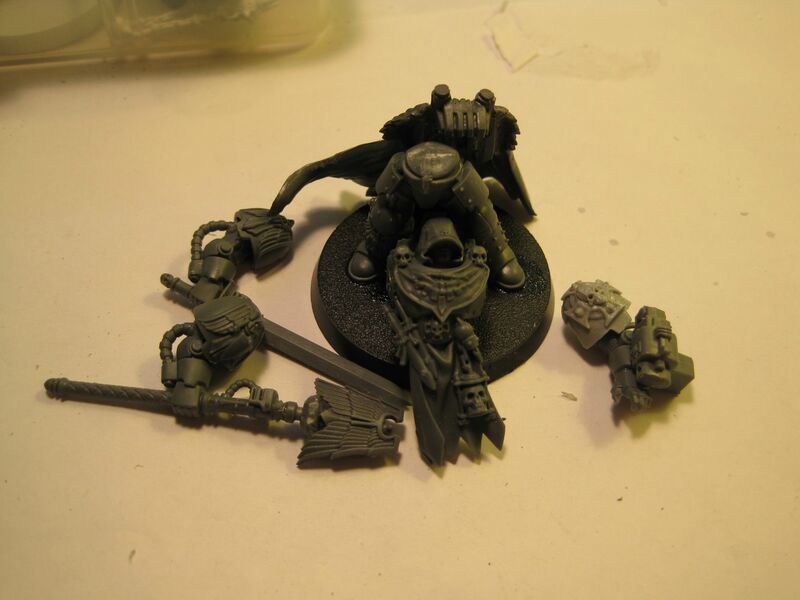 I could of used the cloak found in the Deathwing Command Squad box, but as I was trying to line it up to the back torso of the Grey Knight bit I used, one of the clamps would not be connected. Which I knew would infuriate me. Luckily I still had a Chaos Space Marines Terminator Lord cloak laying around from a Belial conversion I was going to do, but obviously didn't due to my December Vow. I forgot to mention, his arms are magnetic. So if I want to give him an axe, or any other special weapon in the future, all I'll have to do is make one. And as a treat, I've got a few pictures of him fully tacked together. Please excuse the poor shots, since he's still a work in progress I didn't feel like using the light box on him. That's pretty much it on the modeling front, I hope to base the Librarian later today. Right now I'm going to base him as all my regular terminators and just paint the non Crux Terminatus shoulder blue to symbolize his office. While I like Chaplains being all black, I really don't like the all blue of Librarians. It's probably why I dislike the Ultramarines color scheme as well. Onto the gaming front. I managed to get a quick 2 turn game in yesterday. It was really short because by the end of turn two it was time to get going to a Pathfinder game my opponent and I were playing. I unfortunately don't have his list, I forgot to ask for it but I think I can remember a good portion of it. This game took place in my basement instead of our FLGS. 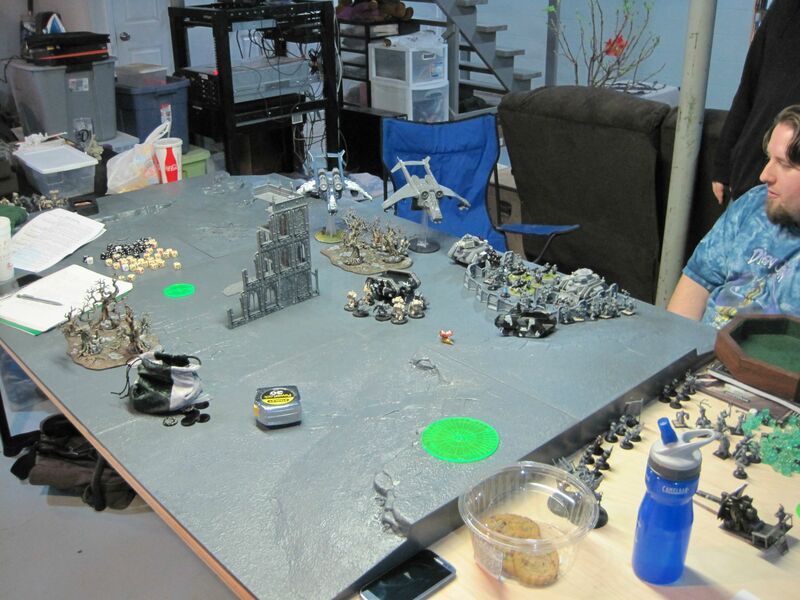 I just recently got my basement back from my contractor and was able to set up the gaming table that I wanted to. Mark that off my New Years Resolution List! Onto the Battle Report! This is my beginings of my NOVA Open list for the Grand Tournament they are having. I know I should probably do Banner of Devastation spam list, but I just love the Deathwing too much. Like I said before I don't have his list at hand, so hopefully I remember most of it. One Infantry Platoon deploying as a blob squad with heavy weapons in the Infantry squads. Another Infantry Platoon being broken down in deployment. Both Platoon Command Squads with flamers loaded up into Chimeras with flamers on them. We got Purge the Alien with Dawn of War deployment. I won the roll off and chose to go second. 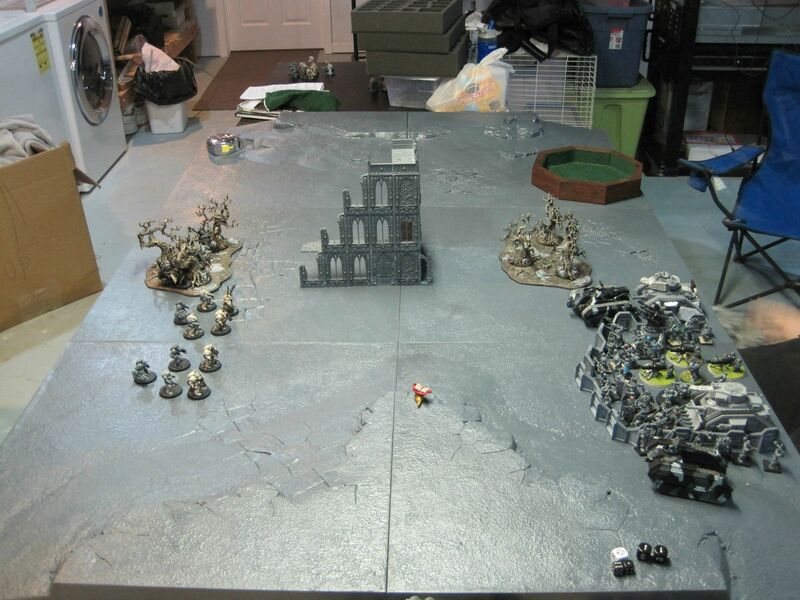 After terrain was set up this is what the board looked liked. 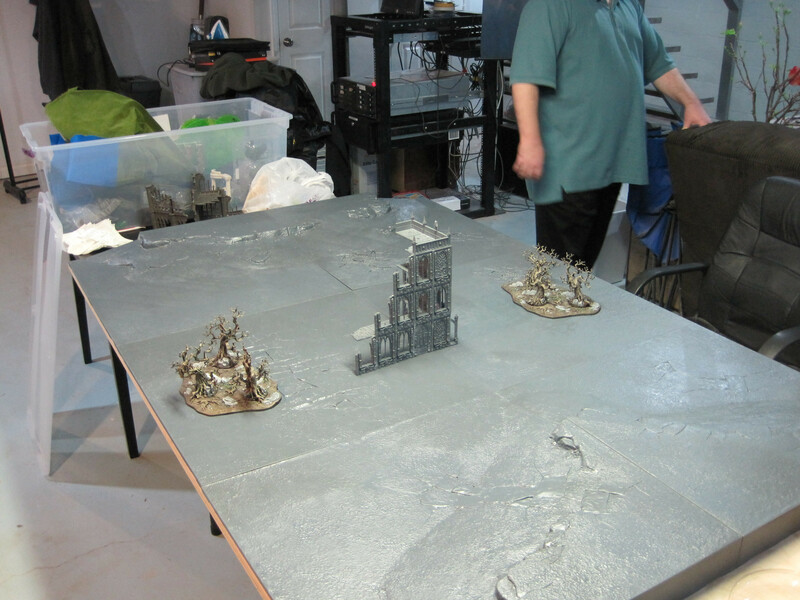 We counted the top of the hills on the table ends as area terrain, which is why it looks like there wasn't much terrain, but in actuality there was. My opponent rolled for Warlord traits from the book, getting something about messing with reserves. Which is pretty much wasted versus my army. I took Belial's Warlord Trait. After that I declared that Belail, Librarian, Troop 1 and Troop 4 were to Deathwing Assault. I marked down that they would arrive on turn 1. Off Topic: I know the board isn't painted, so some might say my New Years Resolution isn't really completed, but I don't think I'll have enough time to paint the board in the next few months. Also what I'm really concerned about is after painting it up, how to seal it so the paint doesn't get chipped during play. My opponent deployed his forces in what was known as a "Chum Ball Formation." He feared the Deathwing Assault. I deployed my Bikers in the trees while leaving the other Deathwing Terminators out in the open. I chose not to seize the initiative. My Librarian's powers this game were Prescience and Perfect Timing, which in theory would have been great versus the Aegis my opponent had. My opponent moved 2 of his Chimeras forward and moved to his shooting phase. I only lost one Terminator to his shooting as most of it was out of range at this point. Njal had activated his powers making all terrain count as difficult terrain 24" around him. My turn saw all the Deathwing in reserve arrive. Belail and the Librarian had joined the 10 man Terminator unit. Which I placed that in front of his Aegis Defense Line. I lost the chainfist in the 10 man squad to Njail's difficult terrain. The other Deathwing Squad arriving from reserves landed close in the forest on my opponents side of the board. I moved the Ravenwing Black Knights up into the ruins. 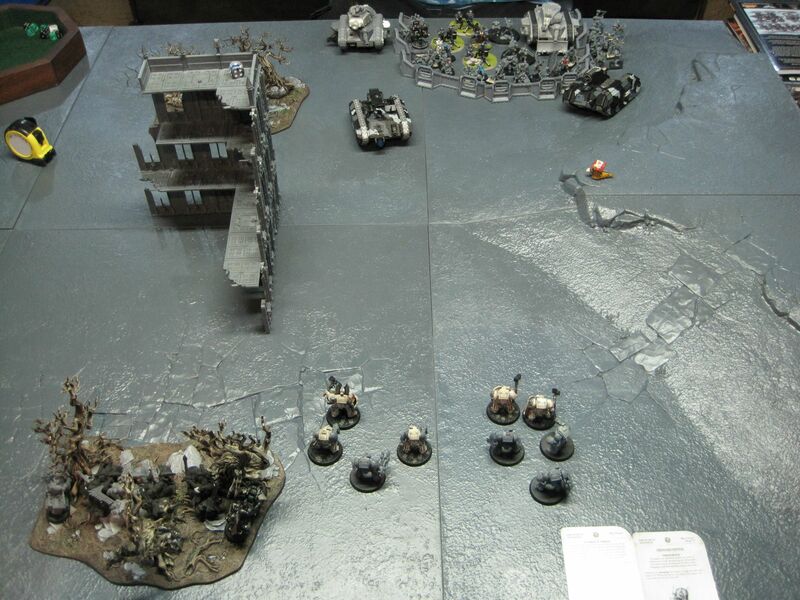 Then I turbo boosted them through the ruins, hoping to get within shooting/charge distance next turn of the blob. Belial's unit opened up on the blob squad behind the Aegis. The guard went to ground and only lost a few. I then shot the plasma cannons at the closest Chimera, they both scattered off into my 10 man Terminator unit causing me to lose the CML and put a wound on a Librarian. A sign of things to come. The Assault Cannon squad opened up on the blob squad and caused a few more deaths. At this point I had only killed about 10 guards men behind the Aegis. This is where it gets really bad for the Deathwing. My opponents Vendettas arrived and took position to unload on the Deathwing. His Chimeras also moved to a better firing position on the 10 mans squad as well. Njal rolled up his ability where you must pass a moral test around him, which really didn't effect me with my Deathwing. Then during shooting he ordered his squad to get back up. Njal casted Jaws of the World Wolf at the 10 man squad, losing one. One Flamer Chimera opens up on the 10 man unit causing me to lose 3 Terminators. Now is where the blob decimates the 10 man unit. Everything shot at it. Leaving only Belial and Librarian. This got my opponent first blood and a Kill Point. Then it is the Vendetta's turn. They open up at Belial and the Librarian, causing them to both die. My opponent gets Slay the Warlord and two Kill Points. Then the Manticore and other flamer Chimera open up on the Ravenwing Black Knights, I lose a total of 4 to that. I move the Assault Cannon squad closer to the Blob Squad along with the Plasma Cannon Squads. I split fire all the squads, so heavy weapons fire at Chimeras and Storm Bolters fire at the blob squad. I only manage to put a hull point on one of the Chimeras. 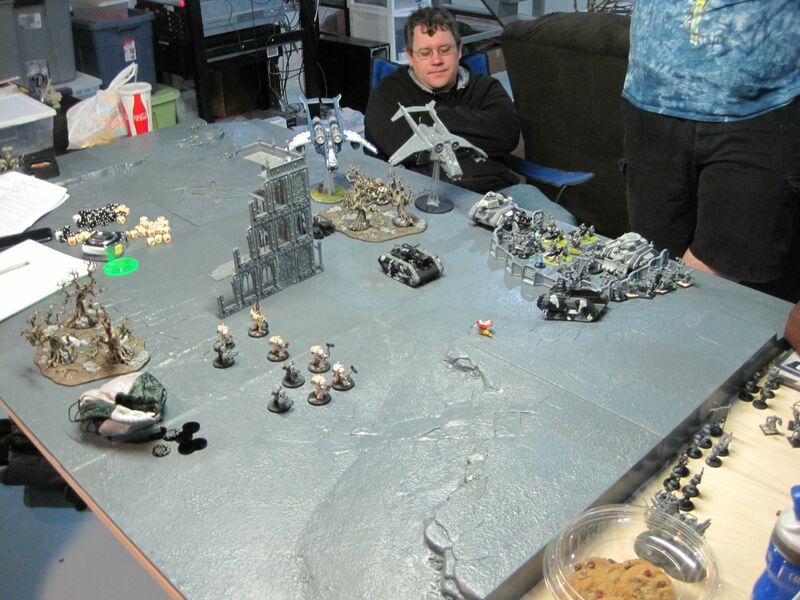 I then shoot the Ravenwing Black Knights at the Blob Squad causing them to lose 1 toughness and lose 1 guy. I move into assault and manage to get both Plasma Cannon squads into assault with the Chimera, losing none to wall of flames. I try to charge the Black Knights into the blob but the blob manages to kill the last 2 on Overwatch. Another Kill Point for my opponent. 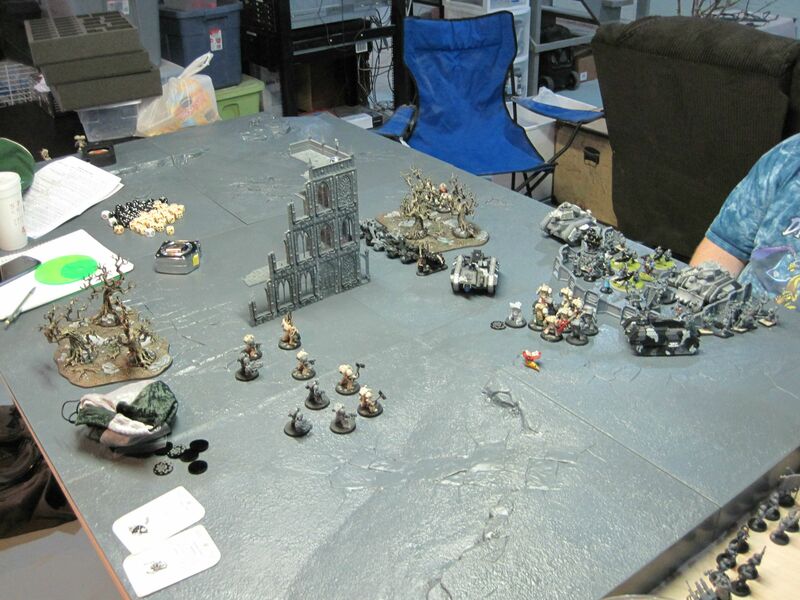 I then destroy the Chimera with my terminators netting me a Kill Point. 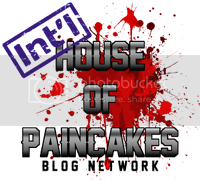 At this point we had to call it since our Pathfinder game was about to start. Even though we only got 2 turns in I learned a lot. Like you can't treat all terminators like Deathwing Knights. And if you're going to throw something in an opponents face like that you need something else scary to punish your opponent if he ignores it. Which the Blackwing Knights could of done, if I didn't roll so poorly for their saves. So far I like the list, but I think I'm going to drop the Assault Cannon Squad for a unit of Deathwing Knights to put Belial in. That way I can Deep Strike them in front of my opponent and say, hey deal with T5 Terminators. T5 would of been really handy here since most of the wounds came from Lasguns that are S3. Then I could have the Black Knights be that other scary unit, especially because I would leave the Librarian with the 10 man Terminator unit to deep strike around them. With this little tweak, and some more play time with the list, I think the list will be a force to contend with. Now I just need to find the time to get more games in!